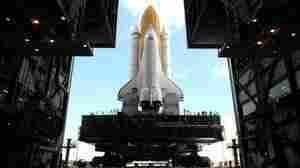 July 21, 2011  Space shuttle Atlantis touched down in Florida early Thursday morning. This is the final homecoming for NASA's 30-year-old shuttle program, as the agency retires its fleet of spaceships and faces an uncertain future. July 20, 2011  When NASA wrapped up its spaceship programs Mercury and Apollo, it had new vehicles ready to replace them. But the agency has no such plan now that the space shuttles are retiring. Some people say it's a sign the organization has lost its way, but the agency's leaders say NASA has a robust future. 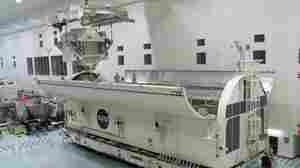 July 19, 2011  At the facility where the retired space shuttles are being dismantled and prepared for museum displays, some technicians say even though much of the work is routine, it feels different knowing the spaceships are now permanently Earthbound. July 18, 2011  Much of a space shuttle, from thermal tiles to the electrical system, is made by hand and crafted by skilled workers. 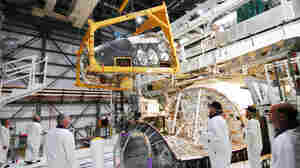 Five years ago, NPR visited a shuttle workshop. Now, as the program concludes and shuttle construction and refurbishment winds down, we return to see what's next for the people who handmade the spaceships. 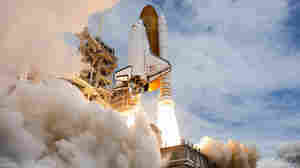 July 9, 2011  When the space shuttle program began more than 30 years ago, it was billed as "our biggest bargain in out-of-this-world research." Flights never became as routine or cheap as NASA had initially envisioned. 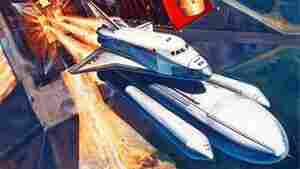 Still, many say the shuttle fulfilled its promise of being a reusable spacecraft. July 8, 2011  As hordes of reporters wait for the launch of the space shuttle Atlantis, it's unclear if they'll see a blast off or a lot of rain. About 1 million people are expected to watch the historic launch in Florida — and many more will tune in through TV, radio or the web. 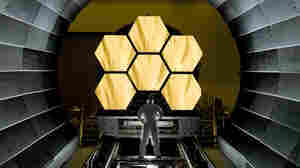 June 8, 2011  A recent independent review said the James Webb Space Telescope will cost about $1.5 billion more than the $5 billion NASA had planned to spend. But the telescope will be able to peer at the very first galaxies and reveal parts of the universe that have never been seen before. 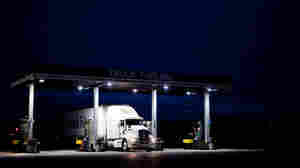 May 31, 2011  What gas guzzler travels 0.8 mph, gets 32 feet to the gallon and carries the pride of America on its back? Meet the crew of "the crawler" — an enormous beast of a machine that will carry the space shuttle to its launchpad Tuesday night for the very last time. May 18, 2011  The World Health Organization is once again about to debate whether or not to destroy the world's remaining stocks of the deadly smallpox virus. We take a look at what has — and what hasn't — changed in the arguments for and against, as the organization gets set to discuss the matter later this week. 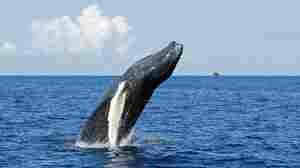 April 22, 2011  Humpback whales migrate thousands of miles across vast expanses of open ocean each year. New tracking technology shows that the whales swim in amazingly straight lines, despite encountering storms and strong currents. Researchers are trying to figure out how they do it. April 20, 2011  Saying they resent both the cost and the intrusion, some truckers are resisting a proposal that would mandate electronic monitoring of their time behind the wheel. Advocates say the monitors will boost safety.